Sync you control — cloud or local Wi‑Fi. Windows + Android + Mac + iPhone/iPad. This will be your StickyID. There was a problem processing your transaction. You are using a Sticky Password Premium (single-seat, standalone) license. Do you really want to upgrade to Sticky Password Premium for Teams (multi-seat) license? You are using a Sticky Password Premium lifetime license that never expires. If you want to buy an additional license (e.g. for someone else), please use a different email address for the purchase. You are using a Sticky Password Premium for teams (multi-seat) license that can be administered only by your team-admin. To buy or renew your multi-seat license, or to add more seats, please contact your team-admin. If you want to buy a new Sticky Password Premium (single-seat, standalone) license, please ask your team-admin to remove you from the team or use a different email (StickyID) for the purchase. You are using Sticky Password Premium for teams (multi-seat) as a team-admin. 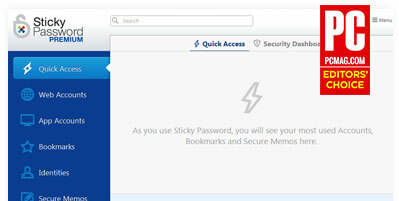 To buy a Sticky Password Premium for Teams license click OK to continue to the eshop for teams. To purchase a new Premium (single-seat, standalone) license, please ask another team-admin to remove you from the team (so that we can assign the new license to this email / StickyID) or use a different email (StickyID) for the purchase. You are using Sticky Password Premium for teams (multi-seat) as a team-admin. All license operations for your multi-seat team license (e.g. renewal, adding seats) must be performed from your StickyAccount. Click OK to log in. Based on 2100+ reviews of our Android app. Copyright © 2001 — 2019 Lamantine Software. Protecting millions of passwords since 2001.
or call +420-511 126 454 (Czech Republic, std. charges apply). Service hours: Mo - Fr, 8:00 AM - 4:00 PM (GMT/UTC).